Take a bite out of a delicious Chicken Salad & Feta Wrap. These Chicken Salad & Feta Wraps are easy to make and filled with yummy ingredients. Combine all ingredients except tortillas. Spoon chicken mixture evenly onto tortillas; roll up. 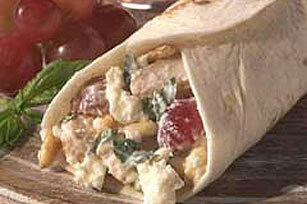 Pack this wrap for lunch along with some crunchy fresh vegetables. Preheat oven to 350°F. Spread pine nuts in single layer on ungreased baking sheet. Bake 7 min. or until lightly toasted, stirring occasionally. 4 servings, 1 wrap each.